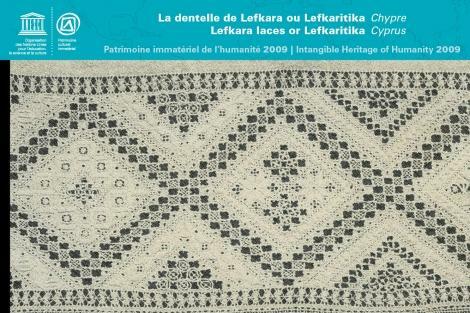 The tradition of lace-making in the village of Lefkara in southeastern Cyprus dates back to at least the fourteenth century. Influenced by indigenous craft, the embroidery of Venetian courtiers who ruled the country beginning in 1489, and ancient Greek and Byzantine geometric patterns, Lefkara lace is made by hand in designs combining four basic elements: the hemstitch, cut work, satin stitch fillings and needlepoint edgings. This combined art and social practice is still the primary occupation of women in the village who create distinctive tablecloths, napkins and show pieces while sitting together and talking in the narrow streets or on covered patios. Unique mastery of the craft is passed to young girls through years of informal exposure and then formal instruction by their mother or grandmother in applying cotton thread to linen. When she has learned her art thoroughly, the lace-maker uses her imagination to design work that embodies both tradition and her own personality. Testament to the ability to appreciate multiple influences and incorporate them into one's own culture, lace-making is at the centre of daily life for women of Lefkara and a proud symbol of their identity.